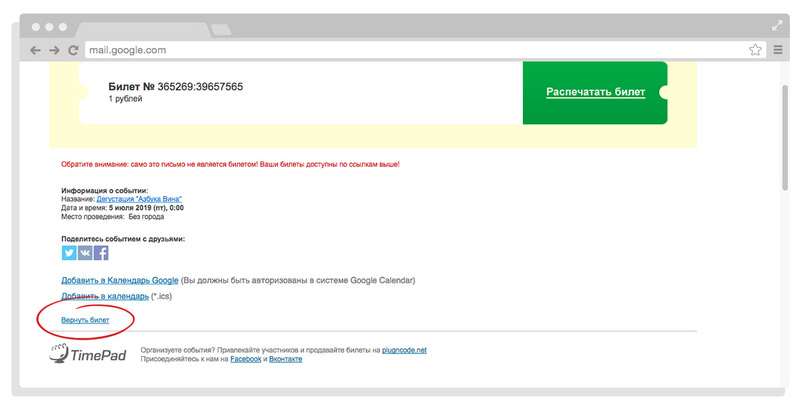 If you want to return an e-ticket, you can make a request to an organizer via the link in a letter with an e-ticket (“Вернуть билет”). The organizer will consider your request and return the money by himself or will entrust this to TimePad. You can find the refund conditions for your event in the Agreement on the provision of services for the organization of the event, which is located under the registration form. We will notify you of the processing of your request by e-mail. The organizer has the right to withhold up to 15.5% of the order value. You should remember that we cannot refund a part of your order, only the entire amount of tickets. Money will be refunded the same way you have made the payment. Exception - payment by cash via Связной or payment terminals. In this case, you should contact our support service and get the recommendations (support@timepad.ru). To clarify the time of consideration of your refund request you can always contact the organizer via the feedback form on the page of the event or use the contacts from your e-ticket.